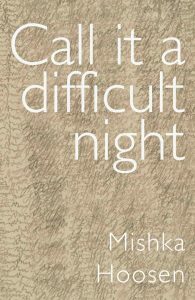 Call it a difficult night is a story about madness. Using anecdotes, poems, dialogue, and fragments of historical research, it follows a nonlinear path in tracing the life of its young narrator/protagonist. Institutionalized after a ‘final break’, a young woman remembers in sharp detail her disturbing childhood visions, which have become overwhelming by the time she is at a boarding school in the US and later at a university in South Africa. When she finally gets a diagnosis — temporal lobe epilepsy — a doctor explains that she is likely to be either demented or brain dead by the time she’s 30. Set mainly during the short spell in the mental hospital, the story proceeds through encounters with nurses, doctors, other patients, and also the friends who visit her – many of them frightened by her state of mind. These encounters, painful but quite often funny, takes us deeper into the feelings of the young woman and further into the workings the mental health system which generates the definitions of madness. She is defiant in her noncompliance and deeply suspicious of her treatment. She is sure that her hallucinations, dangerous and terrifying as they are, are preferable to the dulling effects of her medication and its theft of her creativity. Please click here for the first three chapters.